In 2016, Degreed acquired Gibbon, a pioneer in developing software to curate and share learning resources from across the internet. Based outside Amsterdam, in The Netherlands, it was Degreed’s first big step expanding into Europe. But that was only the beginning. Almost three years into Degreed’s European expansion, Gibbon has blossomed into a fast-growing product, engineering, customer support and sales office (and is still hiring). Degreed now has commercial teams on the ground in the UK, Switzerland and The Netherlands. The company works in dozens of local languages, with a range of native European content sources already integrated. And Degreed recently opened a new data centre in Germany. That focus, investment, and effort seem to be working for its clients, too. Degreed’s European client base more than doubled over the last year - and it’s closing in on 1m licensed users across the region. “So,” says Sarah Danzl, Degreed’s Director of PR and Communications, “we’re proud and excited that Fosway Group, Europe’s HR industry analysts, has just recognised Degreed’s product innovation and growing market presence in the 2019 Fosway 9-Grid™ for Learning Systems. Chris McCarthy, CEO of Degreed, comments, “We’re investing heavily to build our team, operations, and infrastructure in order to meet the unique needs and requirements of European customers. We’re honoured that Fosway’s research validates all that work. To learn more about Degreed, visit the company’s stand at Learning Technologies, Europe’s leading showcase for organisational learning technology, which takes place on 13th and 14th February at ExCeL London. Visitors to the event can also hear how Photobox Group and Anglo American are working with Degreed to drive continuous improvement in their people’s skills. It’s also possible to join Degreed at one of its upcoming Degreed Focus workshops in Paris or Amsterdam. 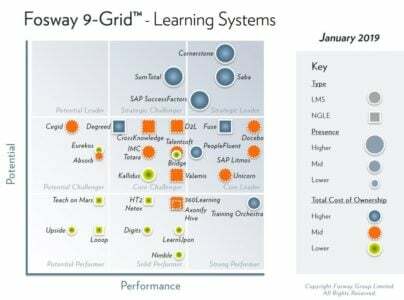 You can access the 2019 Fosway 9-Grid™ for Learning Systems here. Degreed is a smart way to discover, learn and certify the skills needed for the future. Degreed connects all the resources people use to learn and grow, including corporate learning systems and millions of courses, videos, books, articles, podcasts, and subject experts from thousands of sources. Then it adds data science and machine learning to provide people and businesses with the tools, analytics and feedback they need to stay ready for whatever’s next. Founded in 2012, Degreed is headquartered in San Francisco, with additional offices in Salt Lake City, New York and Amsterdam. “We’re proud and excited that Fosway Group, Europe’s HR industry analysts, has just recognised Degreed’s product innovation and growing market presence in the 2019 Fosway 9-Grid™ for Learning Systems."